After much anticipation, the maintenance staff at Cinnabar Hills has begun to re-level the range tee. Today is probably the most time consuming part of the whole project and that involves removing the sod from the existing tee. To cut the sod extremely quick, we used a 4 in 1 bucket on our Bocat with the blades open and just skimmed underneath the sod. It looked like Almaden Country Club and the pig damage they have been experiencing. 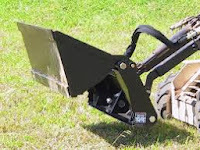 The four foot width of the 4 in 1 bucket beats the 18" width of our ryan sod cutter. With the sod removed, we will till the soil and begin the rough grade tomorrow. As soon as the rough grade is complete, the drainage will be installed and irrigation sprinklers will be set. Not having done many projects this year, this is a lot of fun to end the year with. Stay tuned for updates and check the Cinnabar Hills Golf Club website for when the range will be closed and open.